UPDATED 9:37 P.M. EDT U.S.A. David Ian MacGregor Fraser, a New Zealand resident who allegedly used the Zeek Rewards’ username of “sovlife,” has challenged a U.S. Court’s jurisdiction over him in a clawback lawsuit filed in February by Zeek receiver Kenneth D. Bell. Bell alleged that David Ian MacGregor Fraser received $89,722 from Zeek’s “unlawful combined Ponzi and pyramid scheme.” The receiver, who contends the U.S. Court has jurisdiction in international clawback actions in part because Zeek operated from North Carolina and sent money from the state to participants such as MacGregor Fraser, is seeking a judgment in that amount, plus interest. He alleges the money came from Zeek victims. The U.S. Securities and Exchange Commission described Zeek in 2012 as a massive, cross-border fraud scheme that had gathered hundreds of millions of dollars. In October 2014, alleged Zeek operator Paul R. Burks was charged criminally with wire- and mail-fraud conspiracy, wire fraud, mail fraud, and tax-fraud conspiracy. Earlier in 2014, Zeek figures Dawn Wright-Olivares and her stepson Daniel Olivares pleaded guilty to criminal charges filed in 2013 — Wright-Olivares to investment-fraud conspiracy and tax-fraud conspiracy and Olivares to investment-fraud conspiracy. 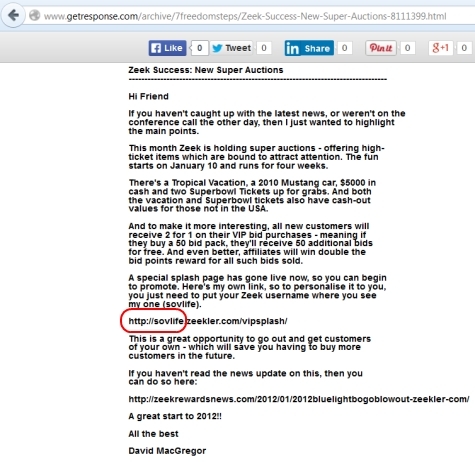 Web records suggest MacGregor Fraser used the shortened name of “David MacGregor” when pitching Zeek online through GetResponse.com, an email service sold in the United States and other countries. If you haven’t caught up with the latest news, or weren’t on the conference call the other day, then I just wanted to highlight the main points. Screen shot of promo for Zeek. Red highlight by PP Blog. MacGregor Fraser, who is represented in the clawback lawsuit by North Carolina attorney June K. Allison of Shumaker, Loop & Kendrick in Charlotte, answered Bell’s complaint as “David Fraser.” The answer, however, acknowledges the longer version of the name as it appeared in Bell’s complaint. So does an affidavit submitted to the U.S. court by David Ian MacGregor Fraser. The moniker “sovLife” appears repeatedly on the website theclassifiedsplus.com through which videos play. Some of these videos point to MLM “programs” such as the Empower Network in which “sovLife” is used as the affiliate ID. Other videos at theclassifiedsplus point to a web entity known as sovereignlife.com. This domain is styled “SovereignLife” and identifies its operator as “David MacGregor.” There is a corresponding YouTube account in that name through which videos viewable through theclassifiedsplus.com play. Some individuals who may identify with the word “sovereign” have participated in various fraud schemes, have painted their fellow human beings as slaves (see Frederick Mann) or government-owned property (see Kenneth Wayne Leaming) and have expressed an irrational belief that laws do not apply to them. Other “sovereigns” have made wild claims that they hold diplomatic immunity and thus cannot be prosecuted or are answerable only to Jesus Christ. Compared to the “David MacGregor” video suggestion that America is evil, the David Fraser response to Bell’s clawback complaint before Senior U.S. District Judge Graham C. Mullen of the Western District of North Carolina includes no inflammatory rhetoric or claims of evildoing by the United States. Fraser, through the American law firm, is seeking dismissal of the complaint for lack of jurisdiction. He also is seeking to quash process in New Zealand, even though he acknowledges he has been served. He also contends he was “unaware that ZeekRewards originated in North Carolina.” This, too, may be in possible conflict with information generally known about Zeek, in that Zeek openly operated from North Carolina and invited participants to events held in that state. At one point in its history, Zeek openly advertised auctions for sums of U.S. cash — even as it preemptively denied it was operating a pyramid scheme and complained that the U.S. Social Security system was a “legal” and “collapsing” pyramid scheme. Precisely why Zeek was making political statements on its website is unknown. Accused Zeek Ponzi schemer Paul R. Burks lived in North Carolina. In 2012, Federal Election Commission records showed that Burks gave money to the campaign of U.S. Presidential hopeful Rep. Ron Paul. From a U.S. standpoint, Zeek used offshore payment processors such as SolidTrustPay and AlertPay, both of which provided services for the $119 million AdSurfDaily Ponzi scheme broken up by the U.S. Secret Service in 2008. Now-jailed AdSurfDaily Ponzi-scheme operator Andy Bowdoin also made donations to a political cause, according to the 2010 indictment against him. AlertPay eventually transitioned into Payza. Bell has said he is continuing to investigate STP and Payza transactions, and federal prosecutors in the District of Colombia have been soliciting information on Payza for more than a year. In his defense filings, Frazer said he “made or received” Zeek payments through AlertPay over the Internet, but maintained he’d never set foot in North Carolina. Now, he contends, he unfairly is being “haled” to appear in court in North Carolina. “To ask him to defend this suit halfway around the world on account of falling into the [Zeek] Insider’s international Internet scheme would clearly offend traditional notions of fair play and substantial justice,” his lawyer argued. In court filings, Fraser says he has been a citizen of New Zealand since 1978 and was born in Great Britain. He is a citizen there, too, according to his affidavit. one would think Mr. MacGregor’s complaint would actually be with whoever mislead him into the scheme……not the entity that uncovered it. Business as usual for the sovereign community I guess. Lack of jurisdiction? He actively promoted, recruited for, and received fraudulent transfer proceeds from an American entity. Of course it’ll have to be an American court to ask for the money back. Also, doesn’t the fact that he tried to respond THROUGH a US lawyer sort of defeats his own argument? But then, I know law’s a complicated mess. this is where all sovcits/freemen expose the fraud they are. Lack of jurisdiction? He actively promoted, recruited for, and received fraudulent transfer proceeds from an American entity…..
Actually he is absolutely correct, US courts have no jurisdiction over him. And the receiver knows it very well, it was just a first simple step to expect most will return the money or settle, the next step will be local court recognition of US court decision in matters of those who claims no-jurisdiction. The Receiver already has the local court authority to file his lawsuit if the person doesn’t settle. Otherwise he wouldn’t have made the demand. You never make a demand that you cannot follow up with the action you state will happen if you don’t settle. But doesn’t Zeek’s affiliate agreement bound any one who did business with it to North Carolina (US) law? I’m pretty sure it did, but it has been a long time since I read it. Most of these agreements do have that clause the laws of the place where I is doing business governs all agreements. Another nail in his bogus claim. All smoke and mirrors trying to get out of paying back his ill-gotten gains just like all the U.S. winners thinking they are entitled to their ill-gotten gains.